The name Tel Aviv in Hebrew means "Hill ( tel) of Spring (aviv)". This is the title given by Nahum Sokolow to his Hebrew translation of Theodor Herzl's book Altneuland (German: " The Old New Land"). There is an account that Sokolow came up with the Hebrew title "Tel Aviv" to allude to the destruction of the ancient Jewish state and its hoped-for restoration: aviv = "spring" to symbolize renewal; and tel to symbolize the destruction of the ancient state, following not the usual Hebrew meaning of the word "tel" but its use in archaeology, meaning "mound of accumulated ruins". Sokolow took the name from the Book of Ezekiel, 3:15 : "Then I came to them of the captivity at Tel Aviv, that lived by the river Chebar, and to where they lived; and I sat there overwhelmed among them seven days." (The spelling in the King James Version of the Bible is Telabib ). The Aviv referred to is possibly an indirect reference to a Mesopotamian god or goddess believed to bring forth the season of spring. (The Arabic تل الربيع (tal al-rabeý) was used before 1948 to name the area. It literally means "Hill of Spring", with ربيع, rabeý specifically denoting grass and flowers that flourish in the Spring time. Jaffa is Yafo in Hebrew, which may well be derived from yafah/yofi (beautiful) or may simply come from the name of its founder, Japhet, son of Noah. This port city is mentioned in the book of Jonah. A mention of the city by the name of "Japo" was found on an ancient Egyptian tax register clay tablet found at Tel el-Amarna, which could render the etymological derivation from "yofi" (or "Yefet") unlikely. The corner of Sheinkin St. & King George St.
Tel Aviv was founded on empty dunes north of the existing city of Jaffa. This photograph is of the auction of the first lots. Multimodal traffic in Tel Aviv: pedestrians, private vehicles, buses, trucks and taxis (and accessible from the other side of the building shown is also a train station). Dizengoff Square, named after Zina Dizengof the wife of Tel Aviv's first mayor Meir Dizengoff. 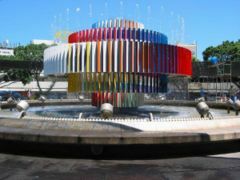 The fountain was designed by Yaacov Agam and combines fire, water, movement and music. The settlement in the area of modern southern Tel Aviv (the neighbourhoods of Neve Shalom and Neve Tsedek) was started in the 1880s as a substitute for the relatively expensive Arab neighbourhoods of Jaffa. In 1908 the Ahuzat Bayit homebuilders association bought land north of Jaffa. Building started in 1909, and the association admitted members of two sururbs established nearby. In 1910, the common name of Tel Aviv was adopted. At its founding, Tel Aviv was intended only to be a suburb, a bedroom community, with the workers commuting to Jaffa. However, disputes between the Jews of Tel Aviv and the Arabs of Jaffa in 1921 led the inhabitants of Tel Aviv to create a new central business district. 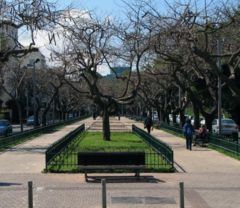 The master plan for development of the city, based on a framework of central routes and boulevards, was designed in 1925 by Patrick Geddes and adopted by the city council under Meir Dizengoff. Owing to its proximity to the port of Jaffa, and its status as the first Jewish community that immigrants saw when coming into the country, Tel Aviv quickly grew to become the centre of Israeli urban life, which it remains to this day. During the 1948 Arab-Israeli War, for a period of eight months (May-December 1948) during the Arab blockade of Jerusalem it also served as the temporary capital of Israel. When Jerusalem was proclaimed the capital, most embassies stayed in the Tel Aviv area. Thirteen more moved there in the early eighties . In 1950 Tel Aviv and Jaffa were united in the single municipality Tel Aviv-Yafo. Tel Aviv has been targeted several times by Palestinian terrorist groups. On October 19, 1994, a suicide bomber exploded on the Line 5 bus killing himself and 25 civilians. On March 4, 1996, another suicide bomber exploded nearby at an ATM and killed 18 civilians. Оn June 1, 2001, a suicide bomber exploded in a line for a discotheque and 32 were killed. On January 25, 2002, 20 were killed in a suicide attack. On January 5, 2003, in two nearly simultaneous attacks, 23 were killed. On 17 April 2006, 10 people were killed and dozens wounded in a suicide attack near the old Central bus station. 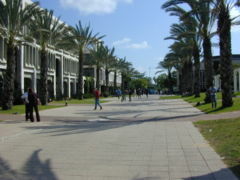 Tel Aviv University is one of the largest universities in Israel. It has an excellent reputation internationally, mostly famous for its physics, computer science and chemistry departments. There are many cultural centers in Tel Aviv, including the Opera House where Plácido Domingo was the house tenor between 1962 and 1965, as well as the Culture Hall (with 3,000 seats). Tel Aviv also has many theatre companies and theatre halls. The Israeli National Theatre, Habima Theatre ("The Stage") is the most recognized, but the Tel-Aviv Municipal Cameri Theatre, the Jaffa-based Gesher Theatre, and Beit Lessin Theatre are also well-konwn. Tzavta and Tmuna are smaller theaters used mainly for musical and fringe productions. In Jaffa, the Simta ("Alley") and Notzar ("created") theaters also specialize in fringe. Tel Aviv has many museums and art galleries. The Eretz Israel Museum is known for its rich collection of archaeology and history exhibits. 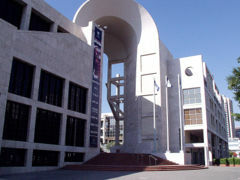 Tel Aviv Museum of Art is one of the major art museums in Israel. The campus of TAU houses the Jewish Diaspora Museum, dedicated to Jewish history throughout the world. Carrying both historical documents and art, the museum tells the story of Jewish prosperity and persecution throughout the centuries of exile. Batey Haosef Museum is a museum for the military history of the Israel Defense Forces. It is regarded by many experts and arms collectors as a real jewel, containing rare exhibits and authentic pieces from Israel's history as well as a wide variety of firearms and pictures. The Palmach Museum near Tel Aviv University offers a unique multimedia experience, as well as vast archives, depicting the lives of young self-trained Jewish soldiers who eventually became the first defenders of Israel. Near Charles Clore's garden in north Jaffa, Israel, there is a small museum of the Etzel Jewish militant organization, one of whose achievements was conquering Jaffa for Israel in the 1948 Arab-Israeli War. The Tel Aviv Exhibition Centre which is located in the northern part of the city. Between the 1930s and 1950s, approximately 2500 structures in the Bauhaus or International Style were built in Tel Aviv. In July 2003, Tel Aviv's White City was declared by the UNESCO council as a World Heritage Site. Tel Aviv has several public parks and gardens, the biggest being The Yarqon Park. Gan Meir, named after first mayor Meir Dizengoff, is located on King George Street. Tel Aviv hosts the largest Gay Pride Parade in Israel followed by Jerusalem (the only country to do so in the Middle East), drawing upwards of 100,000 people. 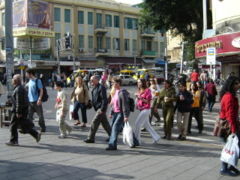 Tel Aviv is known for its openness as well as its thriving night life. 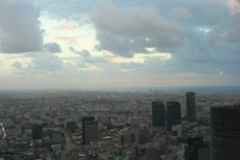 According to December 2001 statistics, Tel Aviv's socio-economic status was classified as high (8 out of 10). 63.1% percent of twelfth grade students received graduation certificates in 2000. In 2000, the average monthly wage stood at 6,773 NIS, roughly the national average. According to Newsweek, Tel Aviv is a flourishing technological centre. As a result of immigration from the former Soviet Union, many computer scientists now live and work in Tel Aviv. The city is considered by Newsweek to be one of the top ten most technologically influential cities in the world. Actually, it is the metropolitan area (including suburbs such as Herzlia and Petah Tikva) that contains much of Israel's high-tech muscle. Tel Aviv is the home of some of the top sports teams in Israel, including a world-class basketball team. Tel Aviv is the only city with three teams in the Israeli football premier league. Maccabi Tel Aviv Sports Club was founded in 1906 and competes in over 10 sports. 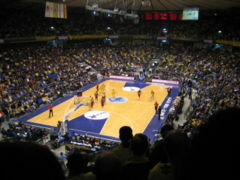 Maccabi Tel Aviv basketball has 45 Israeli titles, won 35 editions of the Israel cup, and has 5 European Championships. The Maccabi Tel Aviv FC football club has 18 Israeli league titles, won 22 editions of the Israel cup, two Israel Toto cup and two Asia cups. Maccabi's Judo club athlete Yael Arad won a silver medal in the 1992 Olympic Games. Hapoel Tel Aviv Sports Club was founded in 1923, and over the years has included over 11 sports, including Hapoel Tel Aviv basketball club (5 Israeli championships, 4 Israeli cups) and Hapoel Tel Aviv football club (13 Israeli championships, 11 Israeli cups, one Toto cup and once Asia champion), kayaking Club, women's basketball club and more that have always been amongst the top Israeli clubs. Bnei Yehuda Tel Aviv Tel Aviv's football club (once Israeli champion, twice Israeli cup holder and twice Israeli Toto cup holder) is the only Israeli football team in the top division (Ligat Ha'al) that represents a neighbourhood - Shechunat Hatikva ("The Hope Neighbourhood") in Tel Aviv - and not a city. Other football clubs which used to play in the top division were Shimshon Tel Aviv and Beitar Tel Aviv, which are now merged into one team that plays in the 3rd division ( Liga Artzit). Maccabi Yafo is another former 1st division team that currently plays in the lower divisions. Tel Aviv is also the home of many other sports. 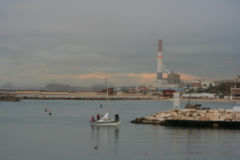 Two rowing clubs operate in Tel Aviv. The Tel Aviv Rowing Club, which was established as early as 1935 on the banks of the Yarkon River, is the biggest rowing club in Israel. The beaches of Tel Aviv provide arguably the most vibrant Matkot scene in the world. 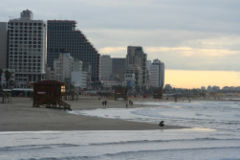 Tel Aviv has a mediterranean climate with hot summers and cool, rainy winters. The average temperature in summer is 26 °C and in winter, 12 °C. Humidity tends to be high all year round and October to April is the wet season. The average amount of precipitation is 530 millimetres. Once or twice every winter the temperature can drop down to around 6 °C in the early morning. The temperature can also reach 35 °C during heatwaves. 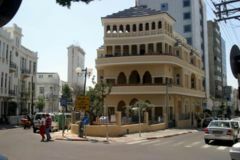 Some of the city's main routes are King George Street, Allenby Street, Dizengoff Street, Rothschild Boulevard and in Jaffa - Jerusalem Boulevard, Jaffa. The main access route to Tel Aviv is Ayalon Highway (a.k.a. Highway 20), which goes through the city - north to south - on Ayalon River riverbed, which has been channeled and runs between the northbound and southbound lanes. Driving south on the Ayalon gives access to Highway 1, leading to Ben Gurion International Airport and to Jerusalem. Other access routes are Namir Road (which connects to Highway 2, and provides access from the North) and Begin/Jabotinsky Road (which provides access from the east, through Ramat Gan, Bnei Brak and Petach Tiqva). Tel Aviv has 4 train stations along the Ayalon Highway. The stops are from north to south: Tel Aviv University, Tel Aviv Merkaz (Tel Aviv Central Train Station), Tel Aviv Hashalom (near Azrieli Centre shopping mall) and Tel Aviv Hahaganah (near the Tel Aviv Central Bus Station). It is estimated that over 1 million people use the train from Rishon LeZion, Rehovot, and Petah Tikva to Tel Aviv and back, each month. The Tel Aviv Central Bus Station, A large central bus station, is located in the south. The main bus network in Tel Aviv is operated by Dan Bus Company. Egged Bus Cooperative, the world's second-largest bus company, provides mainly intercity transportation to and from Tel Aviv. Tel Aviv's airport is Dov Hoz Airport Sde Dov (code: SDV), located at the north of the city and serves as a major airport for domestic flights. Ben Gurion International Airport (code:TLV), Israel's main international airport for people and freight traffic, is located 15 km southeast of Tel Aviv near the city of Lod. Because of its proximity to Tel Aviv and its location within the metropolitan area of Tel Aviv, Ben-Gurion International Airport is often referred to as Tel Aviv International Airport. The area of the airport, however, is not included in any municipal jurisdiction. 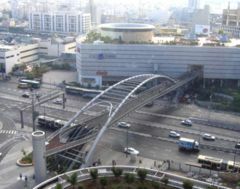 The first phase of the Tel Aviv Subway is planned to be completed by 2012, improving public transportation in the city dramatically.